On October 8, 2015, Justice in Mexico launched a new report that provides a deep analysis of the current process of judicial reform in Mexico. 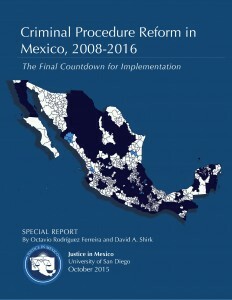 The Criminal Procedure Reform in Mexico 2008-2016, by authors Octavio Rodríguez Ferreira and David A. Shirk, analyzes the process of implementing judicial reform in Mexico as well as the impacts of the reform on the federal and state level, as well as some of the past, present and future challenges to implementation efforts. Overall, the authors find that despite obstacles to the reform’s implementation, significant progress has been made and will continue in the years to come. In 2008 the Mexican Congress approved an eight-year process to improve the criminal justice system, in a reform known as the New Criminal Justice System (Nuevo Sistema de Justicia Penal, NSJP). The NSJP will replace the traditional mixed inquisitorial justice system with a more efficient adversarial model. The new system will be operational throughout the country by June 18, 2016. The authors find that state level implementation efforts were fairly limited up until 2013, and many states are still behind in the process considering the June 2016 deadline. This raises concerns about whether it is realistic that all states will meet the deadline, especially considering that only a little over half the municipalities in Mexico were in judicial districts operating under the new system as of mid-2015. Futhermore, the authors report that federal implementation of NSJP has been a much slower process plagued by delays and insufficient resources that took more than six years to officially begin. The authors note that although the Federal Judiciary Council (Consejo de la Judicatura Federal, CJF) developed a well-structured master plan that outlines three phases of implementation, it will be necessary to modify this plan in light recent challenges to the reform’s full dissemination throughout Mexico. However, the CFJ projects that by 2016 there will be at least one operating center in all of Mexico’s states. The authors also find that the Peña Nieto administration has taken a more active role in the implementation of the new system in comparison to the previous administration. The Ministry of the Interior (Secretaría de Gobernación, SEGOB), responsible for the ensuring the implementation of judicial reforms, is working through the Technical Secretariat (Secretaría Técnica, SETEC) in order to augment incentives for states to continue the reform efforts. In 2014 and 2015 SETEC’s funding to Mexican states increased by more than four million dollars in comparison to the Calderon administration. Moreover, while there has been a vast amount of support for the judicial reforms across party lines in Mexico, there must also be continued collaboration between federal and state governments in order to preserve the progress of the NSJP. The new oral, adversarial procedures in Mexico will involve a period of adjustment and learning, but in light of the significant progress made and to be made in the near future, there may be a diminishing emphasis on the NSJP as the sense of urgency diminishes in the years to come. As such, the authors put forth three policy recommendations that will help sustain its progress as well as support and evaluate the system: a) institutionalization of the change; b) professionalization of the judicial sector; and c) monitoring judicial system performance over the long term. As the reforms will be instituted across all thirty-two states, it is important to solidify the changes associated with the reform in order to avoid discord between the unitary and federal models. The new system outlines a series of checks and balances that regulate members of the judicial system, and it is therefore vital that there is sufficient funding to continue training programs for court officials. Finally, the progress of the reforms must be monitored over the long term in order to allow for the necessary policy and administrative adjustments in the justice system. The Criminal Procedure Reform in Mexico 2008-2016 is the third special report by Justice in Mexico on judicial reform. The study was made possible thanks to the generous support of the MacArthur Foundation and through the work of the Oral Advocacy Skill-Building Immersion Seminar (OASIS) project funded by the U.S. State Department’s Bureau of Narcotics and Law Enforcement (INL) as part of the Mérida Initiative. This entry was posted in Judicial Reform, Special Reports and tagged Blue Report, Judicial Reform, Justice in Mexico. Bookmark the permalink.